There is a right time and a wrong time to make foreign investments - and Pierre Larretche, the French managing director of Armenia's Yerevan Brandy Company, thought he had made the biggest mistake of his career. In the mid-90s Armenia, which had gained independence from the old Soviet Union in 1991, embarked on a privatization programme of state-run enterprises. Mr Larretche, an executive with Pernod Ricard, the French drinks conglomerate, was sent here from Paris to assess the potential of the Yerevan Brandy Company, Armenia's most prestigious business enterprise. "On my recommendation Pernod Ricard paid $30m for the company" says Mr Larretche. "Immediately afterwards the rouble crisis happened and sales to Russia, our main market, dropped by 75%. We suddenly had thousands of barrels of unsold brandy on our hands." 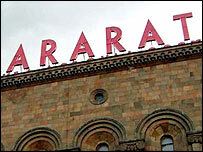 Fortunately for the Yerevan Brandy Company, Pernod Ricard and Mr Larretche, the situation has changed dramatically. Brandy production has risen from a low of 1.7 million litres in 1998 to 4 million litres last year. The Russian market, which accounts for about 85% of exports, has revived. In Armenia, a country of less than three million with few natural resources and in which per capita annual incomes are less than $600 a year, foreign investors are scarce. Pernod Ricard's move into the country is a rare business success story - but it has been a tough few years. "At the beginning, there was a lot of local resentment about foreigners gaining control of a company regarded with great pride by Armenians" says Mr Larretche. "We had to quickly demonstrate we were here to stay and not here to simply asset strip the business." The Yerevan Brandy Company, founded in 1887, had been starved of investment in the later years of the Soviet period. 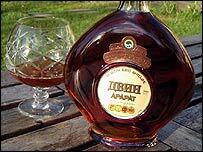 Its main brand name - "Ararat" - was being used by other brandy producers, mostly in Russia. Pernod Ricard, as the company's new owners, had to undertake a series of complex court cases to regain its brand exclusivity. It also had to assure Armenia's grape producers - poor farmers dependent for survival on sales from their vines - that the company would continue buying their produce. "Despite the downturn in the market we kept on buying grapes" says Mr Larretche. "At one stage, due to ongoing production and lack of sales, we built up more than 40 years inventory." As what was once the Soviet market recovered - the Yerevan Brandy Company sells mostly to Russia, Ukraine and Belarus - capital investments were made to streamline the business. In 1998 the business had only one computer - now there are 200. "Armenians are loyal workers and extremely capable managers" says Mr Larretche. "They have a natural gift for business - out of 500 employees here only five are from France." Both to ensure the quality of brandy production and to protect local grape farmers, the government brought in regulations five years ago stipulating that only Armenian grapes can be used in the production of Armenian brandy. "This guarantees our brandy is uniquely Armenian" says Mr Larretche. "But it has created a problem - now we are faced with a shortage of grapes and local prices are rising." Hakob Karapetyan tends grapes on his smallholding in the Ararat Valley, Armenia's main vine growing region. In the early 90s - a time when Armenia was suffering acute economic problems - Mr Karapetyan was forced to uproot his beloved vines and plant vegetables so he and his family could survive. As with many Armenian families, Mr Karapetyan's two children had to leave the country in search of jobs. Life continues to be a struggle but at least Mr Karapetyan feels a little more financially secure these days. "In the old days, I had to take my grapes to the factory and accept whatever price it gave me. Now we have long-term contracts and an agreed minimum price. "I wish I could earn more, but at least these days I have enough to buy food." Mr Larretche is confident Armenian brandy can conquer other markets besides its traditional ones in the old Soviet Union. "At Yalta at the end of the second world war Churchill was so impressed with Armenian brandy given to him by Stalin that he asked for several cases of it to be sent to him each year. "It's a great drink - the equal of any in the world."